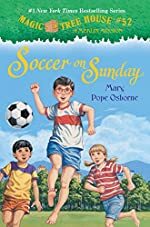 Soccer on Sunday by Mary Pope Osborne. A Magic Tree House Book. Review: If you're a fan of adventurous books, then Soccer on Sunday is the perfect book. In this addition to the Magic Tree House Chronicles, Jack and Annie go somewhere they have only dreamt of going. In Soccer on Sunday, Jack and Annie go to Brazil to find the fourth secret of greatness. After going to the World Cup to see Pele play, they still can't find the secret. They spend the rest of their day with a new friend that might be able to help solve all their problems. Soccer on Sunday is a great book for 7-10 year olds. It has a simple but entertaining plot that is perfect for young readers. Soccer on Sunday is written for children who are just starting to read chapter books, and the vocabulary is appropriate for that level. Jack and Annie are wonderful characters that will appeal to all readers. Plus, like every other Magic Tree House book, it is filled with adventure, excitement, and learning too. We would like to thank Random House for providing a copy of Soccer on Sunday for this review. Have you read Soccer on Sunday? How would you rate it?